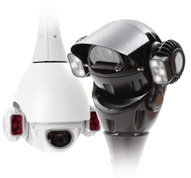 The new RVX-IP30 PTZ and dome camera range adds IP to the X-Series range. The Full HD camera, designed and made in the UK, produces up to three, simultaneous, real-time video streams. Resolution options include a primary stream of 1080p, for recording and 720p, D1, VGA and QVGA stream options, which are optimised for lower band recording, display and transmission. Video compression formats include H.264, MPEG4 or JPEG at up to 12Mbps. The camera uses the same design as the analogue X-Series. It converts from a dome to a ball PTZ camera by the removal of an optional top cover; it is compatible with Redvision’s full range of mounts and brackets; and comes in black or white as standard with RAL colours and marine finishes also available. The standard model has a 30x optical zoom, with 12x digital zoom. Infra-red illumination, Dual Light (combined IR and white light) and a wiper can be added. The IR and white light illumination is effective up to 120 metres and 100m respectively, so that operators can reliably recognise people at up to 40m. The products use a 1 / 2.8-inch CMOS image sensor, with wide dynamic range (WDR). It has low-light sensitivity, operating at 0.35 Lux in daylight mode and 0.05 Lux at night in infra-red mode. Each camera has 100 pre-sets, 24 tours, 16 alarm contacts and up to 24 privacy masks. The product integrates with NVR and video management software (VMS) for network operation in most applications, the makers add. The camera has a flat, optically-correct, toughened glass camera window for image clarity. Low power consumption and a high mean time before failure (MTBF) reduce the camera’s total cost of ownership and maintenance overhead, the makers add. Contact Redvision on 01420 448 448 or visit redvisioncctv.com.